The heat was so sweltering at the OHL Classic in Mexico on Thursday that Zach Johnson’s caddie, Damon Green, needed to tap out after nine holes, leaving the two-time Major champion to battle back from a 2-over opening nine without a looper. Fortunately, he was paired with his old friend Matt Kuchar, who offered Johnson the caddie services of his wife, Sybi, for the remainder of the round. “I knew Sybi was in the crowd, I knew she’d caddied for me before and that she is friendly with Zach Johnson…” Kuchar said after the round. “She knows the deal of keeping up and staying out of the way and so I knew she could handle it; she’d be good to fill in.” Kuchar could not have been more correct. The duo of Zach and Sybi got off to a shaky start with a double bogey on their first hole together, but turned things around with a birdie and two eagles down the stretch to get Johnson back to even par for the day. “It’s funny how when you just have a friendly face around and just go back to playing golf and not worrying so much about making golf too complicated, some good things can happen,” Kuchar said. Sometimes good etiquette doesn’t pay off. Just ask 21-year-old Gian-Marco Petrozzi, whose thoughtfulness in his final round of Stage 2 at the European Tour Qualifying School cost him two strokes and a chance to advance to the final stage of the tournament. Because Petrozzi started his final round in 43rd place and needed a finish of 23rd or lower to move on, the Englishman certainly had his work cut out for him on Monday. However, Petrozzi answered the challenge—or so it seemed at the time—with a 65 that included an ace on the 17th hole (his eighth hole of the day) and five birdies over his last six holes. The hot play vaulted him into a tie for 24th place and a sudden-death playoff for a final stage alternate spot, which would have at least kept his Euro Tour card hopes alive. 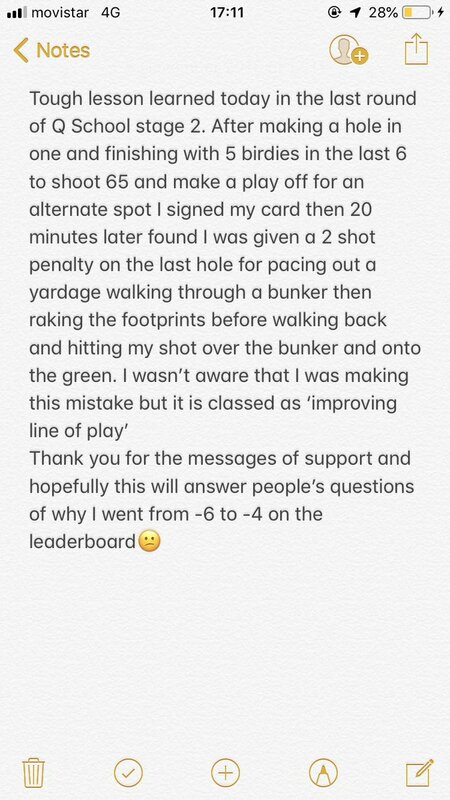 However, Petrozzi was informed just minutes after his round concluded that he was being assessed two strokes for breaching Rule 13-2 on the final hole. The rule, which deals with the improvement of lies, stances or lines of play, was applied when Petrozzi raked a fairway bunker that he had walked through, but not played out of, while scoping out his final approach shot. Somehow, in that act of pay-it-forward sportsmanship, the young man was deemed to have improved his line of play—which is a little ridiculous, right? But the rules are the rules, and those two strokes dropped Petrozzi from a T24 to a T32, ending his bid for a card on the spot. You would think that replicating some fairly basic Fortnite victory dance moves wouldn’t be an issue for the guys on the PGA Tour Champions, who have essentially predicated their entire careers on being agile and rhythmic. But as we learned from this hilarious video released on Wednesday by the circuit’s Twitter account, many of these guys are just as terrible at dancing as we are! In fact, some of them might even be worse, like Tom Lehman and Kevin Sutherland, who both looked like they haven’t busted a move in decades. Although, we do have to admit that we did enjoy watching Miguel Angel Jimenez put his own stamp on the “floss” and “disco fever” dances. That man is a treasure! It was just an average day out on the links for this kid until Tour member Tony Finau and his caddie surprised him with a cool, PGA-style experience. Golly! That is some brazen father-son trust right there. We wouldn’t even let our kids try this with wiffle balls and plastic clubs! From the South Carolina dialect to the follow-through and tee pick-up, this guy nailed this DJ impression. A+! We almost believed his claim that he was going to cut the ball around that tight corner until we looked down and saw the blue jeans and sneakers.